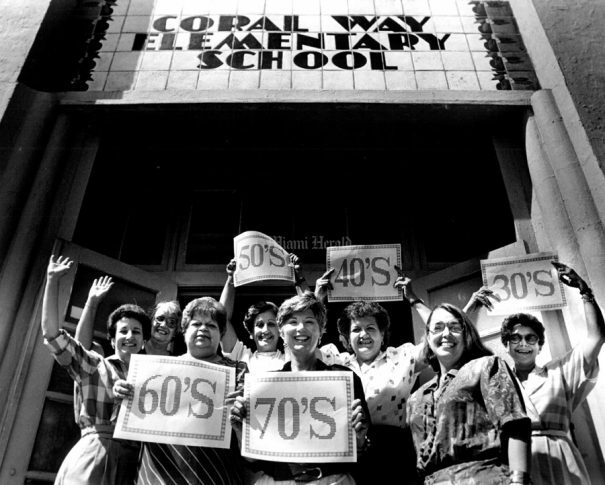 Opening in 1936, with a building designed by Miami architect, August Geiger, Coral Way Elementary was the first bilingual school in the country. 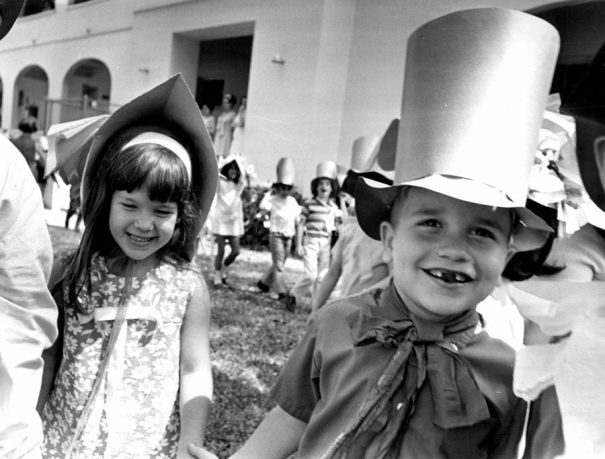 Responding to the first influx of refugees following Fidel Castro’s 1959 rise to power in Cuba, school officials in the early 1960s began planning entirely bilingual schools. With funding from the Ford Foundation, the Coral Way Elementary bilingual program was the first to open, in 1963. 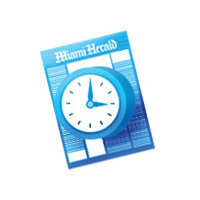 At the time, half of its students were Hispanic. 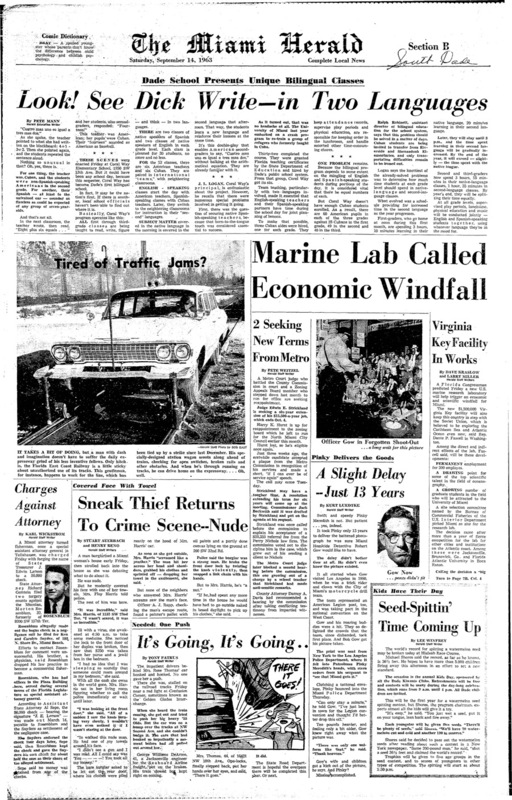 Students were an even mix of Spanish-speaking and English- speaking youngsters. The school curriculum was taught in both English and Spanish languages. 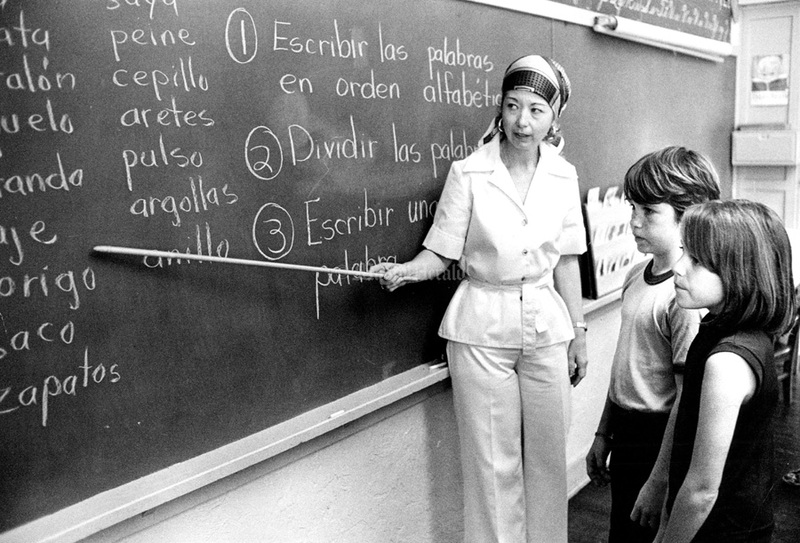 English-speakers and Spanish- speakers shared classes in both languages. 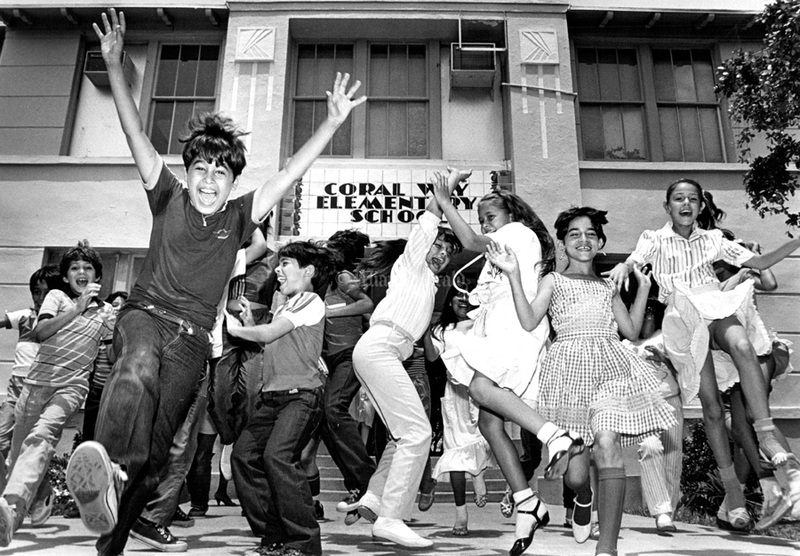 6/18/1985, Albert Coya/Miami Herald: Children leaving the Coral Way Elementary on last day of School. 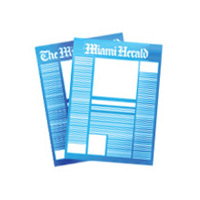 3/6/1950, Fred Brent/Miami Herald: The Daddies' association and principal of Coral Way Elementary recall the up's and downs of the school's 14-year history at anniversary celebration. 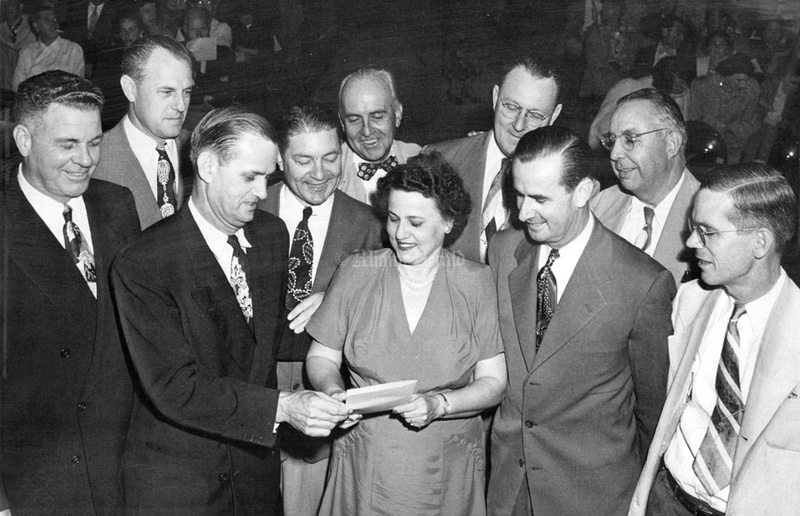 Principal Lorraine Byrnes is surrounded by the past and present presidents of the school's Daddies' Association. They are L to R: William Pruitt, Robert Redden, Allan Frisbee, George Absalon, R.I. Geyer, John Lowe, L.D. Wingo, William Spitzer and Carlton Slade. 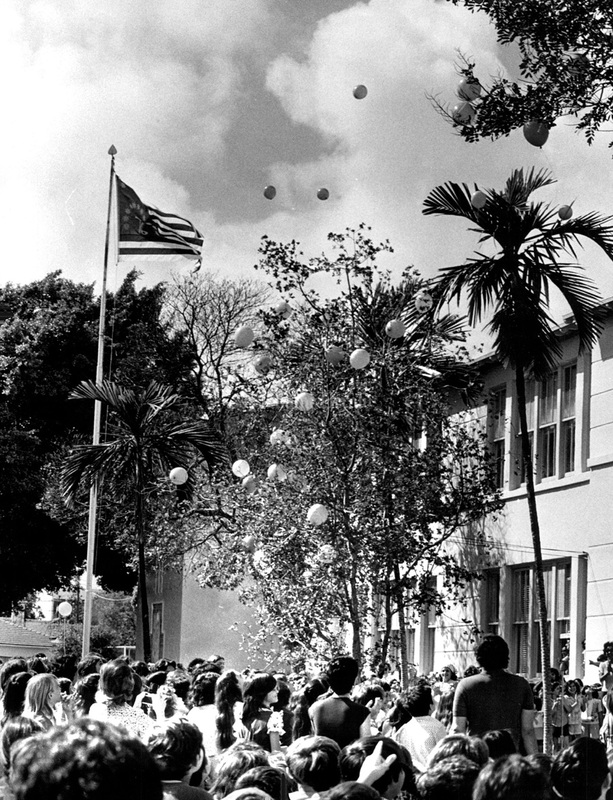 3/3/1976, Bob East/Miami Herald: Sixth graders release balloons after dedicating tree in center and sealing time capsule at Coral Way Elementary. 3/20/1970, Albert Coya/Miami Herald: Lazaro Esquijarrosa and Aleida Martinez at the Easter parade at Coral Way Elementary. 10/20/1986, Mary Lou Foy/Miami Herald: Coral Way Elementary will celebrate 50 years of educating youngsters. In this picture are teachers who currently teach there who have been there since before 1965. Front row from left: Josefina Benetez (holding 60s sign), Maria Pineiro (70s sign). Back row: Velma Papier, Elena del Valle, Melba Leon (50s sign), Esther Benezra (40s), Ana Maria Guell (30s). 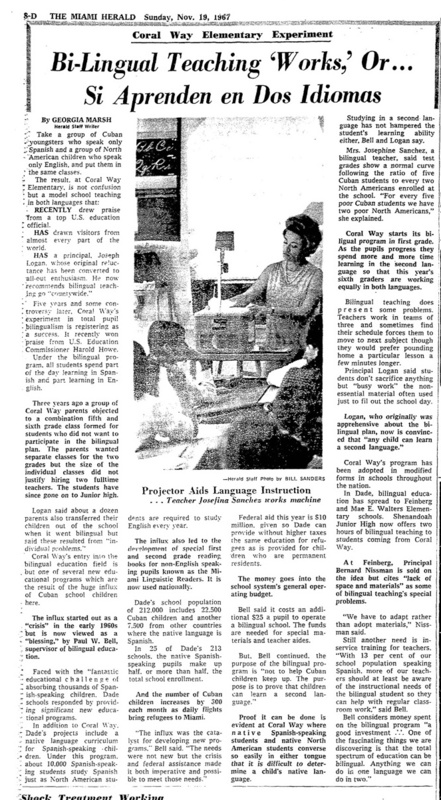 2/24/1975: BILINGUALISM IN SCHOOL. Mrs. Maria Pineiro guides her English speaking pupils George Costello and Diana Maleoley through their Spanish lesson at Coral Way Elementary School Miami. The school became officially bicultural and bilingual last year--reflecting the large numbers of Cuban exiles resident there. At this school pupils study both English and Spanish, and half the day they speak English, half the day, Spanish.